Hello again! It has been too long since I have posted but I assure you, I have been baking up a storm. If you follow my Instagram feed you will see just some of the baked goodies that I have been creating. I have some additional blog posts in the works, so stay tuned. So, if you have haven’t heard The Great British Bake Off has started again in Britain. Last week Tuesday, I among many others tuned in to see the great new cast. It’s a little early to tell who will continue to be great in the competition, but I will say I always have a love for the stay at home parents (toughest job on Earth) and the scientists/ engineers (I just love when a baker comes in with a spreadsheet!). Nevertheless, I tuned in with anticipation as bakers attempted a Signature biscuit (reflective of their home), Wagon Wheels as the technical challenge, and a selfie cookie as the showstopper challenge. Let me just say there was nothing amateur about these bakes. The bakers may not have received technical training but as a fairly gifted amateur baker, I would find these challenges VERY difficult. 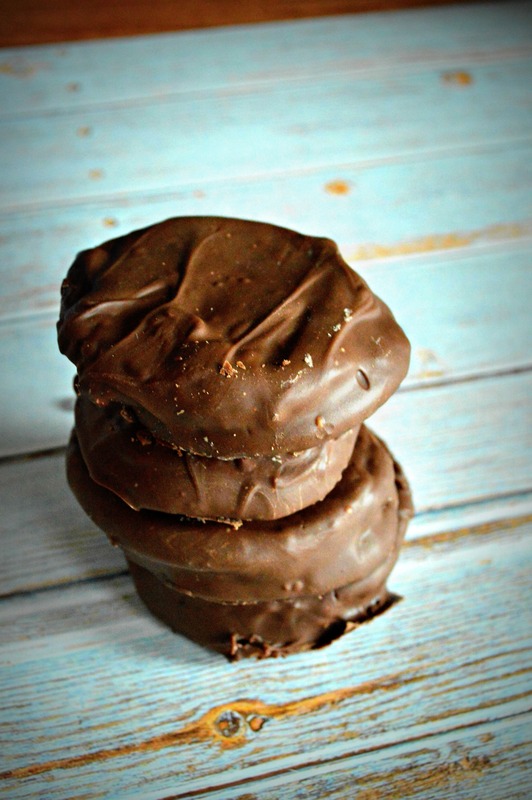 When Pru and Paul warned us that the Wagon Wheels would be hard to produce, I thought meh… they don’t look that hard. The biscuits are comprised of two plain biscuits that sandwich a layer of raspberry jam and marshmallow creme. They are then covered completely in chocolate. The marshmallows looked like the hardest thing to reproduce, I have made hundreds of those. What could go wrong? I didn’t find creating the individual components of this bake so hard, it was the assembly. Before I get into that, I would like to say I wish we had these stateside. They are delicious! I see how they could be a kid favorite, reminiscent of a Little Debbie but a lot better. Plus I love the packaging. Apparently, these cookies were created in the height of the Old West movie hype of Hollywood. Thus the name Wagon Wheels. Check out how cute they are below. To recreate this tasty morsel I used Paul Hollywood’s recipe that can be found here. Just check out the photo of these yummos created by Paul Hollywood a team of highly trained bakers. The hardest part of this bake was covering the cookie completely in chocolate. I wanted them to look uniform and professional. However, the more I manipulated them, the more the marshmallow melted. As a result, I had a few seams burst and jam or marshmallow goodness would escape. In the end, the cookies looked okay. They would not be winners in the presentation but they tasted delicious. I am not quite sure I would be able to create them in the time allotted either. 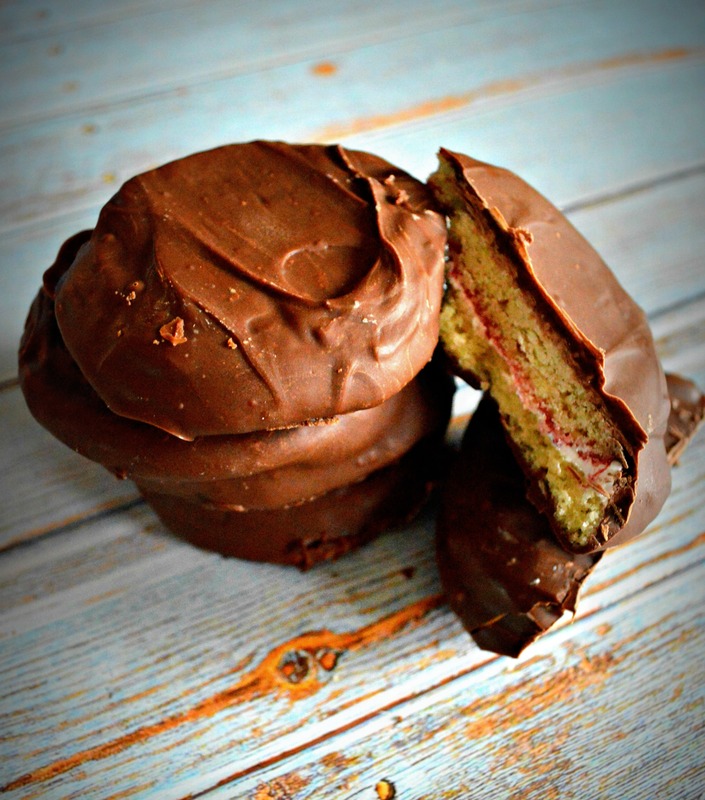 All in all, I would definitely make these again, but I think I would chill the cookie sandwiches before covering them in chocolate. That way the marshmallow would be less apt to melt so quickly. Check out my efforts below. 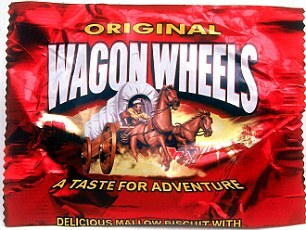 Crack that Wagon Wheel open and you get this yummy goodness. Again, not my most precise work but they are precisely delicious. I can’t wait for cake week tonight! Would you take the time to make this childhood treat? Let me know in the comments below.